1984: Reagan looked tired and slow during his first debate against Walter Mondale. Pundits began to write his political obituary. At the second debate, however, Reagan was asked whether he still had the stamina to handle a major national security crisis. The 73-year-old replied: “I want you to know that also I will not make age an issue of this campaign. I am not going to exploit, for political purposes, my opponent's youth and inexperience.” The quip brought down the house. The “Gipper” was back and Mondale’s momentum was gone. 1992: Ross Perot made news this week by endorsing Romney. Twenty years ago he made news by becoming the only third-party candidate to stand on the presidential debate stage. He made it memorable. He warned that if Congress approved NAFTA that Americans could expect to hear a "job-sucking sound going south" as companies moved to Mexico to cut costs. Perot was wrong on the merits – NAFTA ended up benefiting both the U.S. and Mexican economies. But his vivid phrase, which morphed in the retelling into “a giant sucking sound,” entered the American political lexicon as a pithy way to describe policies that cause great harm. 2008. Barack Obama looked vulnerable on foreign policy when he ran against John McCain. The Arizona senator was a Naval Academy graduate who spent six years as a POW in North Vietnam. 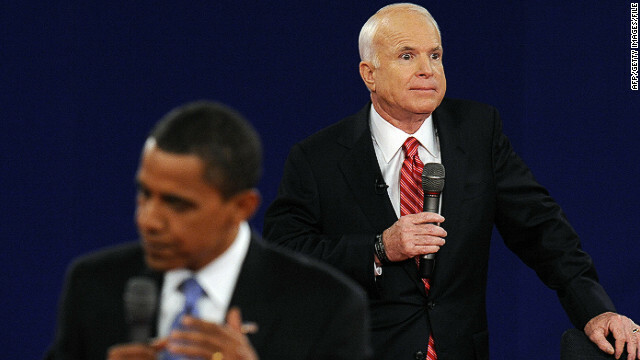 In the first debate, McCain accused Obama of having spoken recklessly about striking al-Qaeda sanctuaries in Pakistan. Obama coolly turned the tables on his rival, saying: “You're absolutely right that presidents have to be prudent in what they say. But, you know, coming from you, who, you know, in the past has threatened extinction for North Korea and, you know, sung songs about bombing Iran, I don't know, you know, how credible that is.” In a single sentence Obama shifted the debate from his judgment to McCain’s temperament. Obama and Romney both aspire to land a knockout punch on Monday like Reagan did in 1984. But they could end up stumbling like Ford or Carter. Either way, it may not matter. Polls show that voters care far more about jobs and the economy than they do about who has the better plan for Iran or Syria. That caveat, of course, won’t stop pundits from arguing for the next two weeks over what the candidates had to say. Only November 6 will put an end to that discussion. « Previous entryWho was the best foreign policy president? Gov. Romney looked like a leader and the Pres. and Obama looked like he was angry throughout the debate. My realty check is $4.18/gal for gas and a daughter out of college w/ a degree and underemployed along with way too many other reasons to not vote for Obama. Romney record tells me he is just what the US needs. It would be nice to be excited about the future again instead of always preparing for the worse. Yeah that whole tax cut thing/deregulation thing really worked for us four years ago. And someone page Obama so he can change the price of gas please..... oh wait, he doesn't have anything to do with it. Please, please, please someone tell Obama to repeal Obamacare so that we can go back to being more at the mercy of the insurance companies so that your daughter can continue to be ouunderemployed while baby boomers who need their job's healthcare stay working longer and medical bills are the #1 reason for bankruptcy in our country. Being excited about the future comes from within yourself, lady, no leader can do it for you. Reagan's Hollywood career had been his biggest asset. He spoke well and clearly. Moreover he could improvise and portrayed himself in the best possible way. Romney doesn't have these talents and he is quite a novice in foreign politics. I’ve been exploring for a little for any high quality articles or blog posts on this sort of area . Exploring in Yahoo I at last stumbled upon this website. Reading this information So i’m happy to convey that I have a very good uncanny feeling I discovered exactly what I needed. I most certainly will make sure to do not forget this web site and give it a glance regularly. Greetings from North Carolina. cool post! Reddit pros would love this. I appreciate you. There is ordinary, and then there is you. Guess I will just book mark this page. Neat page. I enjoy the stuff you provide here. Thank you! That is a smart way of thinking about it. That cleared it up for me. Crazy strange, when I started my computer this site was already running. Thanks for posting this excellent write up. This website really sparked my couriousity. Could you tell me more about this topic? I hate that my browser battery is about dead. Your website is amazing! You could survive a Zombie apocalypse.